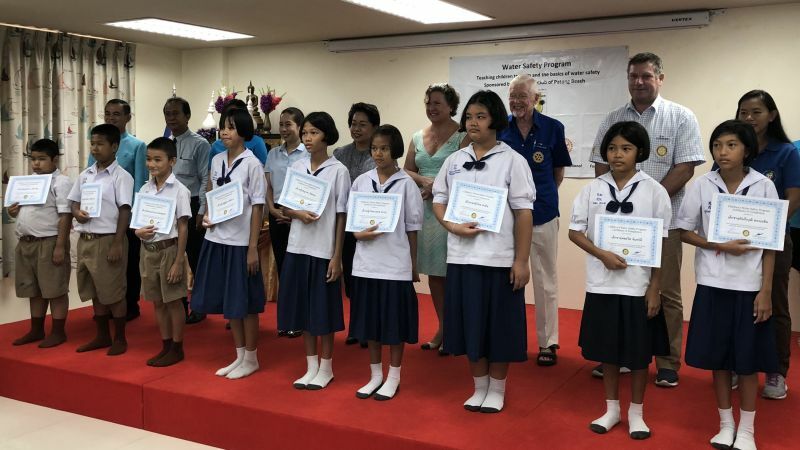 Larry Amsden, past President of the Rotary Club of Patong Beach, is the Project leader for the initiative, and was joined at the ceremony by current President Karen Eidsvik-Moody, Vice President Gary Eidsvik-Moody, and Secretary Walter Wyler. Khun Kob was the lead instructor for the swimming programme. The team of instructors dedicated their time and worked across the 10 week programme. Many allocated their modest fees to the charitable cause, and this donation bought each of the graduating swimmers a pair of swimming goggles to enjoy with their continuing interest in water-based skills. A wonderful and heart-warming gesture. Support for the Swim Safe course came from PADI who provided 8 free subscriptions to the instructors; The Fun Start Camp who discounted the daily pool fees, Child Watch Thailand and the Rotary Club of Chiang Mai International (RcoCMI) who paid for the programme this year. The RCoCMI also provided the training for the Phuket instructors as well as the final testing. Some of the instructors came from Super Divers. Many are freelance and donated the majority of their time. 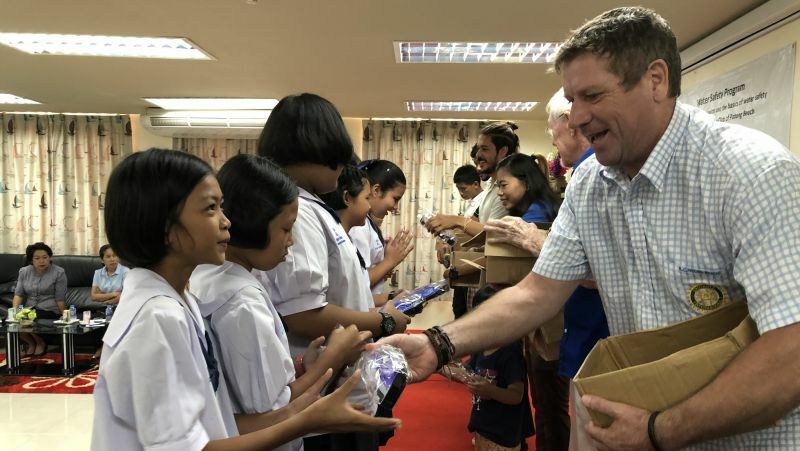 Larry Amsden was instrumental in working with the RCoCMI to understand their previous programme and replicate it here in Phuket. The Phuket instructors will be able to train new participants next year. The Rotary Club of Patong Beach plan to repeat the programme next year and will be looking for more volunteer instructors in June 2019. The plan is to expand beyond this school.